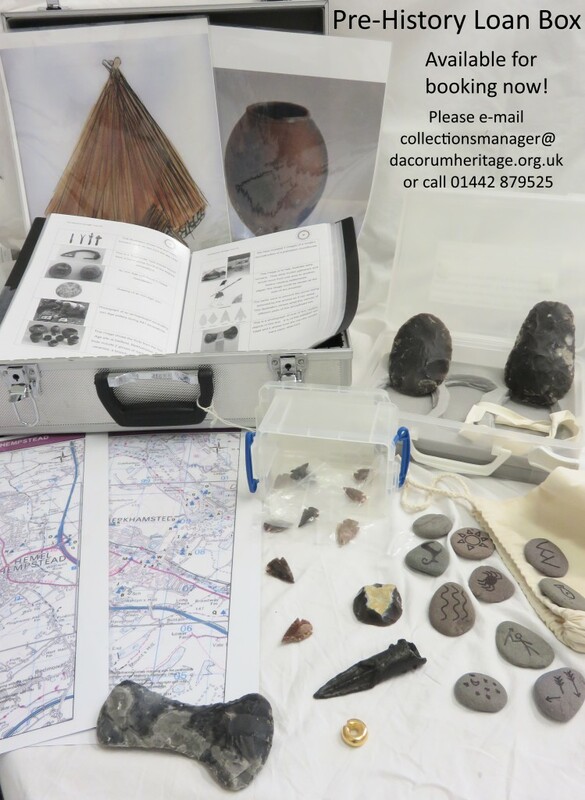 Pre-History Loan box | The Dacorum Heritage Trust Ltd. In one sense history may be defined as past events which have come down to us since the invention of the written word. Events were recorded in writing and we know about them from the written record. Prehistory relates to the time before the written word and we know a certain amount about it by making deductions about the objects or other material left behind. We hope that this loan box will help teachers to illustrate the Neolithic, Bronze Age and Iron Age periods within the classroom. The box includes flint tools such as axe heads, flint scrapers and arrow heads. The box also includes maps of each town, pinpointing where prehistoric finds have been discovered. Suggested ideas and resources for activities have already been prepared. We loan boxes for only £10 for up to one month, plus a returnable deposit of £50.